Pentangle Puzzles and Games has now closed. We have a preferential supply arrangement with Hoyles which gives all Association members a 10% discount on all Go equipment. Details on how to order. There are some alternative Retailers and Suppliers sections below. Masters Games and GoShop Keima, seem to have the widest choice. We no longer have a Bookseller who brings books to tournaments. Go playing sets vary widely in quality. You can get beginner sets under £10, a full-size set with glass stones and wooden board for under £50 or you can spend £1,000 or more. Some sets have mat or wooden boards of various sizes (9, 13 or 19 lines) and plastic or glass stones. There are also magnetic sets for use when travelling. We give some advice on Go sets to buy and what might be suitable for a variety of different circumstances. 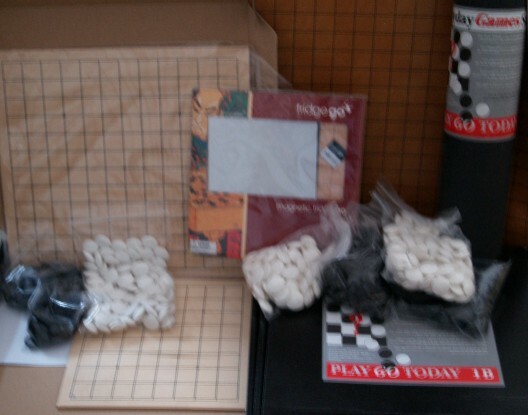 We also have some pictures of Go sets that are, or have been, available in the UK. Don't forget if you're a novice that it is best to start playing on smaller boards before moving up to the large 19x19 one. Some boards have a different size version on the reverse, helping you through this progression without the expense of buying another board. As an alternative to purchasing a set you could make your own. Making stones can be a difficult, so we'd definitely recommend buying them; printing your own 9x9 or 13x13 board is much easier. You might to look at the board of the BGA-designed A3 laminated BGA Takeaway Go Set. If buying stones and boards from differing sources, be careful to check sizes as some slightly larger Chinese stones do not quite fit onto the Japanese-standard boards which are the norm in the UK. A vast number of Go books are available for study, with more than 200 in English. There are books on many subjects from the opening, through tesuji and middle game, to the end game, and also books that analyse complete games by professionals and other strong players. The level of material ranges from beginner level, through intermediate to advanced (for dan players). We have a list of beginners' books and of these the most thorough book is Teach Yourself Go by Charles Matthews of the Cambridge Go Club, but others are available including the large format Learn Go, written and published by Neil Moffatt of Cardiff Go Club. Kiseido: Original English-language instructional material, including the quarterly Go World magazine (ceased publication in 2012). Kiseido took over from the former Ishi Press. Slate and Shell: A growing catalogue of translated and original works, some especially for newer players. Yutopian: Up to 2010 published many translations of Asian Go classics for all levels of play. Hinoki: Up to 2014 published translations of Asian advanced study Go books. Oromedia: Up to 2013 published Korean Go books, often bilingual. 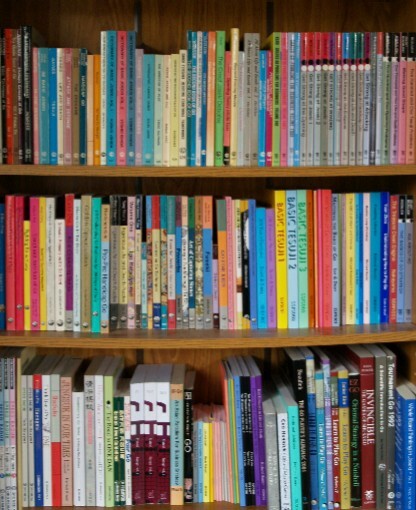 Other smaller publishers and authors also publish Go books. Robert Jasiek is one author with an increasing number of titles. A Historic English Book list, showing books we stocked prior to December 2010, gives an indication of the level many books are suitable for - beginner, elementary, intermediate or advanced. We also have a list of recent publications (from 2004 on). other reviews that can often be found on or Sensei's Library or on Amazon or the publishers' websites. There are various Go terms that have come into common use, mostly from Japanese. In case there is no glossary, our extensive list of Japanese Go Terminology definitions may be useful. Many of you may have come across Go from the various novels that feature Go or from the manga cartoon series Hikaru No Go. Back numbers are available in the UK of the Go World magazine, which was published 4 times a year in Japan, up until publication ceased in 2012. We also provide back numbers of our British Go Journal, available both online as pdf files or on paper. 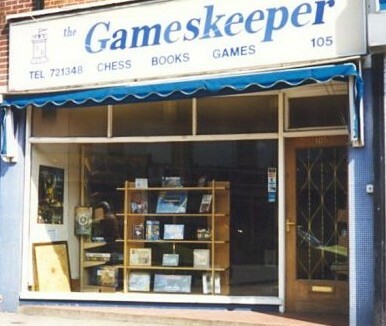 There are a number of UK retailers of books and equipment, including good games shops you can visit. There are various non-UK suppliers that ship to the UK. These include publishers, shops and mail order companies. The most useful of these are Go Shop Keima, the online branch of the Het Paard shop in Amsterdam, and Hebsacker Verlag in Germany.